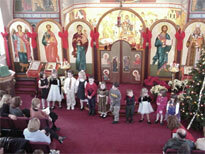 St. Luke held its annual Christmas pagent. 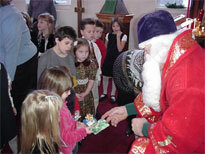 After the youth of the parish finished displaying their talents, St. Nicholas paid a visit with presents for all. 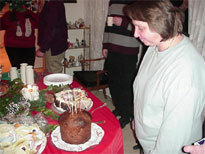 Maria Vrame held a Christmas Party for the choir members to reward them for their efforts. The choir members pitched in to give Maria a little present to thanks her for all her hard work. Ellen Zethermier played the piano while we sang Christmas carols. 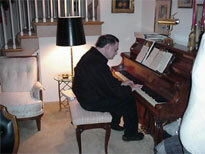 George Poulos even gave a piano solo. Also since it was Laurie Bauml's Birthday, the choir even sang Happy Birthday while Laurie blew out some candles. 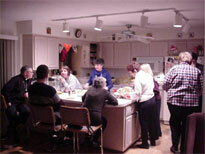 All enjoyed the great food and fellowship. At long last the icons for the altar door are here. 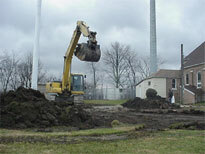 Rob Ketchmark is shown here beginning installation. 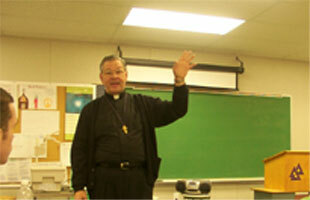 Father Andrew was a visiting speaker at Chicago Christian High School. 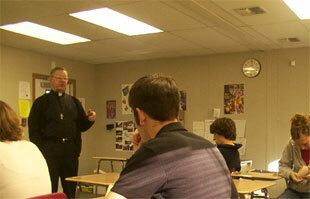 He addressed a bible class on church history and afterwards held a question and answer session. 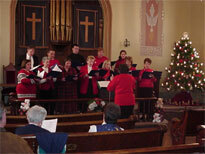 Once again this year St. Luke's Choir was asked to perform at the Lemont Christmas Festival. Following their performance, they recieved glowing praise both from the program host and the audience. Maria Vrame, our choir director, is to be commended along with the choir members for all their work in praising God through song. 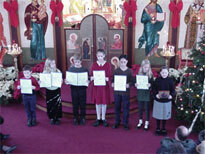 The confirmation class from the Lemont United Methodist Church visited St. Luke's. Pastor Noah Panlililo arranged the visit and knows Fr. Andrew through the Lemont Clergy Association. 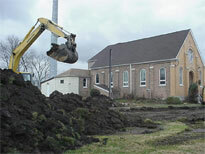 In addition to his duties as pastor, Rev. Noah Panlililo is the Lemont Police Chaplain. 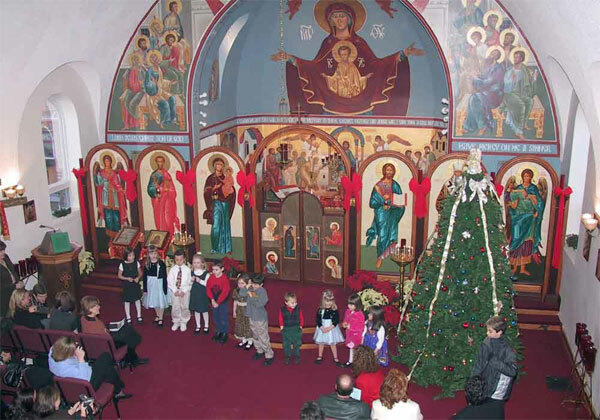 Father Andrew gave a survey of the history and practices of the Orthodox Church. 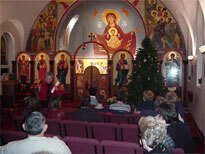 Aristea Zekios enhanced the presentation by presenting a discussion of the use of Icons in the Orthodox faith. A question was asked by one member of the group about prayer. 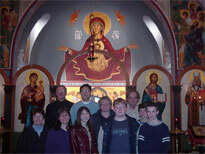 Father assured the group that although Orthodoxy is rich in symbolism, all worship and prayer are addressed to God. 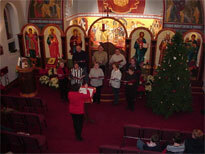 At times saints may be asked for prayer. Pastor Noah invited our YO group to visit their church. 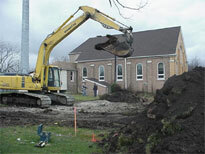 On Thursday morning December 13th, 2001, we finally broke ground for the new building project. Hang on to your hats as things should move quickly now. 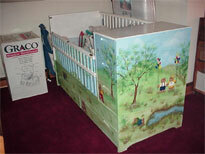 Andrea Dauro lovingly hand-painted a white crib/dresser unit. This furniture became the receptacle for baby things-diapers, blankets, baby clothes, a car seat, and other large and small items-that parishioners brought, all of which (including the crib/dresser) were this year's Christmas donation to PASS (Pregnancy Aid South Suburbs). This pro-life agency, located in nearby Tinley Park, mainly counsels women who have unplanned pregnancies. 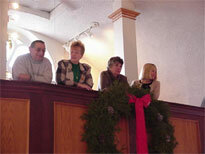 On December 9th Sue Davinger, the founder of PASS, spoke to our congregation. She shared her pro-life ministry and accepted our crib-and-contents donation. She said that after the staff at PASS prayed and carefully considered possible recipients for our gift, someone was chosen. Ms. Davinger indicated that this mother-to-be, whose baby is due in a few months, would gratefully welcome our gift. 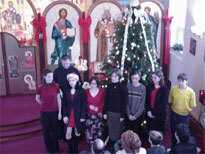 John Adamovich organized a tree decorating party for our youth group. 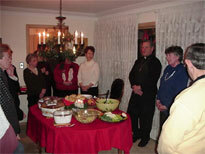 After helping decorate the tree and making the church just a little more beautiful, refreshments were served. Our youth group had a night out at Centennial Lanes. After fueling up with pizza, they attacked the pins. While no one bowled a perfect game, everyone had a great time. The first meeting of the Movie club was held on Sunday Nov. 25. It began at 5 PM and lasted until 8:30 PM. That was 1 1/2 hr. longer than planned. The following comment was made by Ken Stevens who suggested and organized the club. That was a terrific Movie Club initiation last evening....great discussion and great fellowship. We are really grateful that you took so much time to prepare and lead. The Clips is a great idea....I saw things in a different light when they were reviewed, and it was a great stimulus to conversation.The next meeting will be held at the end of January and the movie will be: Pay it forward.